Perhaps having one of the most unique team nicknames in college football, the Texas Christian University Horned Frogs have played at Amon Carter Stadium for over eight decades. The history of the stadium dates to the mid 1920s when the university began discussions of building a new facility. Amon G. Carter, publisher of the Fort Worth Star-Telegram, led the way in the construction of the new stadium, thus it was named after him. The stadium opened on October 13, 1930 when TCU played Arkansas, replacing Clark Field. For nearly two decades the stadium had a capacity of 22,000. 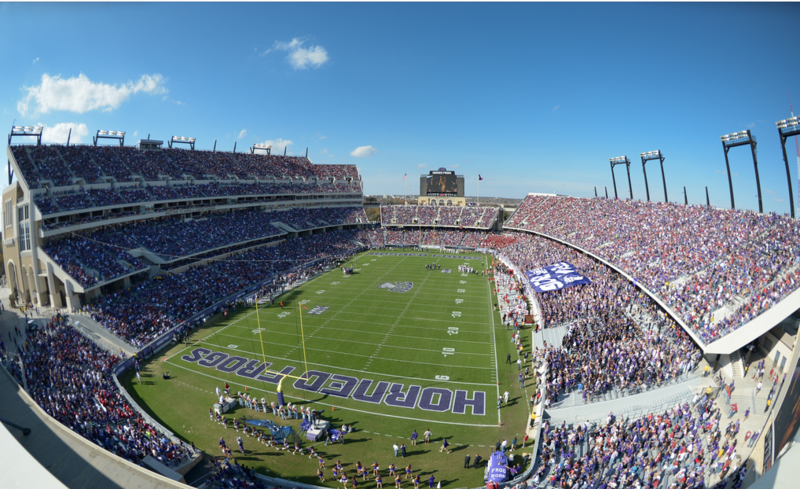 The first expansion to Amon Carter Stadium occurred in 1948 when the capacity of the stadium was increased to 30,500. Grandstands were added in the endzone and on the east side. In both 1951 and 1953 additional seating, boosting the seating capacity to 37,000 was constructed in the same areas. The upper deck of Amon Carter Stadium was constructed before the 1956 season, adding 9,000 seats and a two story press box, pushing the seating capacity to just over 44,000. In 1973, Astroturf replaced the grass field, but grass returned in 1992. A new scoreboard was added in the north and southwest parts of the stadium prior to the 1992 season. However, ten years later a new modern videoboard was added to Amon Carter Stadium in the north endzone. In August 2010, TCU announced plans to renovate Amon Carter Stadium following the 2010 season. Completed by the 2012 season, this $105 million expansion and renovation plan included a new raised seating bowl on the north and west sides of the gridiron, 24 luxury suites, club seats and a new press box. This plan increased the seating capacity to 50,000.